Gluten-Free & guilt-free "nachos". Replacing tortilla chips with sweet mini peppers is the best decision you'll ever make. 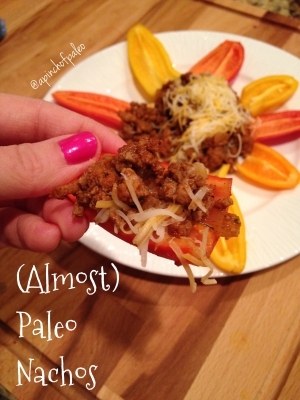 Ditch the cheese, and this will be a completely Paleo, high-protein snack! Heat olive oil over medium heat. Add ground turkey and onions. Brown turkey and cook all the way through, onions will be transparent. While the turkey is cooking, remove stems and seeds from mini peppers, slice them in half, lengthwise to create a â€œchipâ€. Set aside. Add all spices into a small bowl, mix well. Once ground beef is cooked, add spice mixture and stir well. Serve beef on a plate or in a bowl (with a sprinkle of cheese if you wish), and scoop with mini peppers!